Elizabeth Arden has launched Green Tea Pomegranate, the latest in their series of flankers to 1999's Green Tea. The new Elizabeth Arden Green Tea Pomegranate fragrance scent is inspired by the sweet, yet multifaceted fruit and bursts with a sense of unexpected vibrancy. The new Perfume for women from Elizabeth Arden is a bright fruity floral citrus that dazzles with brushstrokes of the scarlet pomegranate for a sparkling new addition to the Green Tea fragrance collection. The new ladies perfume from Elizabeth Arden energizes your senses. 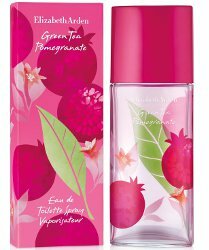 Elizabeth Arden Green Tea Pomegranate is available now at Dillards, in 50 or 100 ml Eau de Toilette. Always willing to give EA Green Teas a sniff! I would be terribly willing if I ever saw any!! Still haven’t run across last year’s fig, and pretty sure I never saw the mimosa from the year before that.